If you’re a fan of the newest generation of animated TV shows like Adventure Time, Steven Universe, and especially digital only series, such as Bravest Warriors and Bee and Puppycat, then perhaps you have already watched Ian McGinty’s (Bravest Warriors) short for Welcome to Showside. The short itself leads into the comic series, also by McGinty, about a young demon named Kit, Moon, a sorceress-in-training, Belle, the daughter of a long line of demon-hunters, and a bunch of their pals. The town of Showside is a hub for humans and demons of certain distinction to live together peacefully. The astoundingly cute short and the first two issues introduces the conflict of various interdimensional portals opening and releasing demons from the Nexus who are trying to capture Kit and take him to his father. However, through the power of friendship and ingenuity, Kit and the gang have defeated each and every one. The cast of fun and quirky characters like Teenomicon, an angsty teenage magical tome, and Boo, an adorable Showside-born demon, really fills out the world. Knowing McGinty’s previous work on the Bravest Warriors comic series, it’s easy to make the jump into his new series (Boo is your new Catbug). While an all-ages appropriate series, Welcome to Showside sports meta humor like you wouldn’t believe that definitely is geared toward the slightly older demographic. In this third issue, the plot really seems to be rolling as we finally see Kit’s father, the Shadow King, and his interaction with the lesser demon, Frank (originally played by Henry Rollins!). It feels as if beyond all the silly and incredibly fun humor of the story, we’re about to delve into some of the mystery of why it is that Kit is so desperately wanted by his father to return to the Nexus; or at least, how far the Shadow King is willing to go. We also get a good look at the importance that Teenomicon really plays in helping Moon out with her magic. While Welcome to Showside is surely light fair, both in writing and in art, I have a feeling that it slowly will develop into something beyond the cute puns and McGinty’s jabs at his own writing. All the characters are being developed slowly, which is actually rather rewarding and definitely makes for an eager wait for the next issues. Like many comics nowadays, after the main plot story is done, you are treated to some lovely back-up comics. In this issue there are quite a few; most notably “What’s In the Box?” by Kate Leth (McGinty’s partner on Bravest Warriors and founder of the female comic retail organization, The Valkyries) and a lovely Little Nemo referential story by Fred Stresing and Michael Knepprath called “8-Bit Kit”. 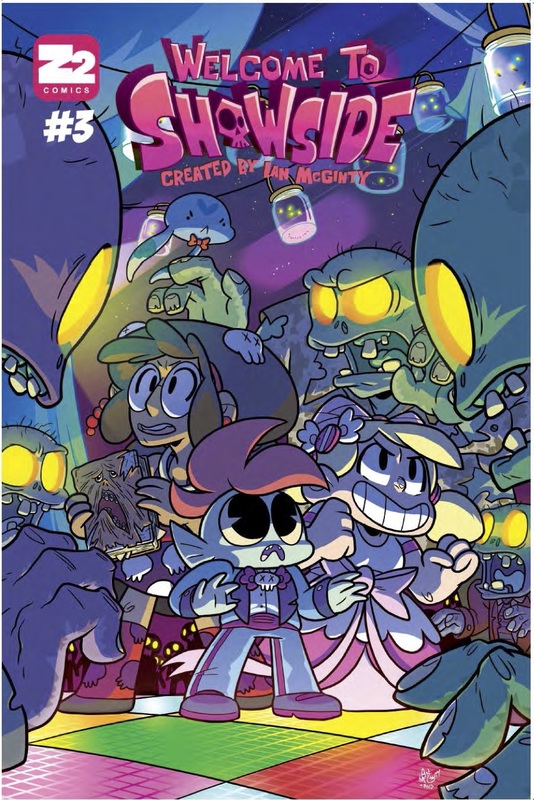 Disclaimer: I received a review copy of Welcome to Showside #3 from Z2 Comics. No Fair Flair: Who’s Really Credited for Charlotte’s Divas Championship?